It's been a long time coming, but now the users of Firefox and Opera browsers don’t need to rely on the Chrome browser to access WhatsApp Web client, as the most popular smartphone messaging service has announced that the Web-based version of its service now works on Firefox and Opera web browsers too. 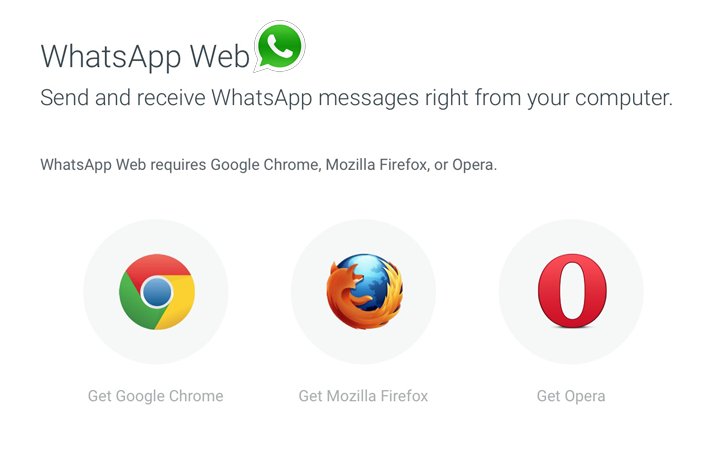 Almost a month ago, WhatsApp launched the web client of its service but the access was limited only to the Google Chrome users. Now, the company is giving more choices to desktop users by launching WhatsApp Web Today for Opera and Firefox browsers, though you’ll still have to wait a little long if you’re a Safari user. WhatsApp Web is nothing than an extension of the core mobile WhatsApp application. It syncs conversations from your smartphone devices to your PCs, with everything stored on the mobile device itself. By scanning the QR code that appears, users will automatically have paired their mobile WhatsApp with the WhatsApp web client, as shown. For now, WhatsApp Web only works with Android, Windows Phone and BlackBerry devices, but unfortunately, iPhones still don't have the capability to scan the WhatsApp Web QR code because there's no web solution at this time for iOS users because of limitations of the platform. Currently, WhatsApp has 700 million users sending 30 billion messages per day, and is bigger than most of its competitors, including Facebook Messenger, Line and WeChat. Now, this new WhatsApp web client available for a wider range of browsers will definitely increase its market.